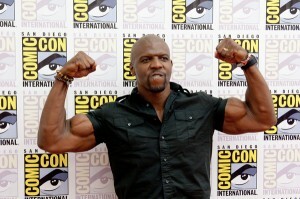 Terry Crews Joins HBO’s ‘The Newsroom’!!! In a casting decision out of left field, action star and uproariously funny Old Spice commercial mascot, Terry Crews has just been cast in Aaron Sorkin’s new HBO series ‘The Newsroom’. Crews will be introduced in episode 6 on July 29. He plays a bodyguard — and unofficial life coach — for Will McAvoy (Jeff Daniels). He’ll appear in five episodes. This is great news. I am a huge fan of Crews. He was in the epic action film ‘The Expendables’ and will be in the upcoming sequel to that movie. He was also the dad on the UPN comedy ‘Everybody Hates Chris’. Not to mention he was the hilarious spokesperson for those amazing Old Spice commercials directed by Tim and Eric. Can’t wait to see him be a life coach on ‘The Newsroom’. Here’s a New Trailer for Aaron Sorkin’s HBO Series, ‘The Newsroom’!! Cate Blanchett & Aaron Sorkin Attached To Lucille Ball Biopic!!! Rosemarie DeWitt & Patton Oswalt Join HBO’s ‘Newsroom’!!! This entry was posted on Tuesday, July 3rd, 2012 at 11:38 am	and is filed under News, Television. You can follow any responses to this entry through the RSS 2.0 feed. You can skip to the end and leave a response. Pinging is currently not allowed. « FedMex Reviews ‘The Amazing Spider-Man’!! !